Designed to separate the Jewish community from the rest of the city’s inhabitants, the Fez Mellah was the first of its kind in Morocco. The name “mellah,” which became the standard term for Jewish quarters throughout the country, isn’t believed to have sprung from derogatory origins; in its former glory, the Fez Mellah was described as an impressive site of imposing architecture, and the region served to fortify the Jewish population from harm. With time, however, the term mellah assumed associations with outcasts and barbarians. In 1465, a pack of rebels attacked the Marinid dynasty seated in Fez, killing the majority of the Jews residing in the mellah and uprooting the cohabitation of Jews and Muslims in the city. 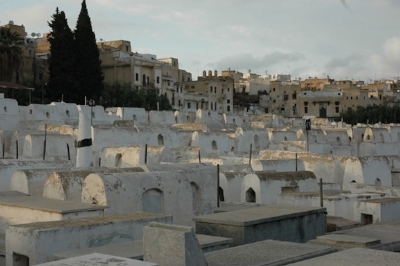 Following World War II, most of the Jews who remained in Fez fled, and the mellah fell into a state of disrepair. Today, the Fez Mellah is supported by UNESCO and a small Jewish population remains, but the site is largely in ruin. A walk through what’s left of the mellah provides a throwback to an earlier epoch; among the mellah’s points of interest is the restored 17th century Ibn Danan synagogue, an arresting Jewish Cemetery with 400 year-old tombstones, and a string of antique shops.